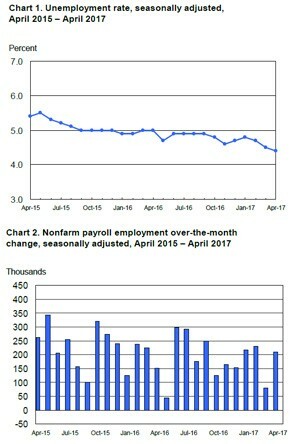 The U.S. job market bounced back in April, adding 211,000 nonfarm payroll jobs during the month, according to data released today by the U.S. Bureau of Labor Statistics. The gains exceeded Bloomberg economists’ prediction of 190,000 jobs added, and followed a weaker-than-expected March that saw 79,000 jobs added, revised down from the previously reported 98,000 jobs. The unemployment rate fell from 4.5 percent in March to 4.4 percent in April, which is the lowest rate since May 2007, Reuters reported. The unemployment rate has dropped by 0.6 percentage point over the year. The labor force participation rate was relatively unchanged in April at 62.9 percent. Leisure and hospitality added the most jobs, gaining 55,000 new positions. Employment grew in the food services and drinking places sector by 26,000. Professional and business services followed, adding 39,000 positions. Over the year, employment in the industry has expanded by 612,000 jobs. Healthcare and social assistance gained 37,000 positions, on par with its monthly average so far for 2017. Financial activities employment grew by 19,000, with the gains largely driven by insurance activity. Average hourly earnings for all private nonfarm payroll employees increased by 7 cents in April to reach $26.19. Last week, a government report was released that showed private sector wages had their biggest growth in a decade in the first quarter of 2017, according to Reuters. With the strengthening employment figures, the Federal Reserve is likely to raise interest rates later this year. Bloomberg also noted that income gains, particularly in real estate prices and stock, have contributed to a more positive consumer outlook.